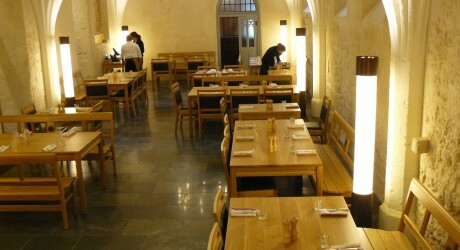 IN November 2011, Luke Hughes and Company won the design competition for the new furniture to be installed in the refurbished 14th century ‘Cellarium’ or Refectory at Westminster Abbey. The new space is now to serve as a restaurant as well as to double-up as a venue for private and official events. So, the furniture needed to be capable of rapid rearrangement, sustain the kind of knocks to be expected from half-a-million visitors annually and also be made of material that is both durable and likely to age gracefully whilst fitting in with the historic 14th century surroundings. Luke Hughes took the view that the new use of the Cellarium should reflect its original associations. For instance, monastic refectory seating would have used benches rather than chairs. Luke Hughes and Company have echoed such traditions and taken into account the demands of modern logistics by constructing a mix of three-seat stacking benches and stacking chairs. The solid-oak tables have pegged tenons and mouldings to match the seating. A medallion of the Abbey Coat of Arms was carved by George Mkrtichian then cast in bronze and inserted into each of the stacking benches. Luke Hughes and Company worked in collaboration with the architect Mark Panter of Panter Hudspith, the caterers Benugo and the Dean & Chapter. Luke Hughes and Company have previously carried out work at Westminster Abbey in the Pyx Chapel and Sanctuary area, which was viewed during the Royal Wedding. Luke Hughes and Co has been based in Covent Garden,Londonsince 1981. Luke Hughes and Co also designs bespoke spa, corporate and institutional furniture for clients across the world including the Mandarin Oriental hotel, Unileaver and The Royal Bank ofScotland. Luke Hughes was one of the first furniture design consultants and makers to embrace sustainable values and practices, with core values of understanding space, reflecting the building’s architecture and creating furniture that lasts. Over the last 25 years Luke Hughes and Co has designed furniture for more than 50 Oxbridge colleges, 20 institutional libraries, 20 major public schools, 17 cathedrals, 81 churches, seven national museums, six royal palaces, 900 corporate boardrooms and 42 luxury spas. MEDIA RELEASE posted by Tartan Silk PR. You too can post media releases (aka press releases) on allmediascotland.com. For more information email here.